Boasting what is deemed to be two of the best manicured courses in South Africa, as well as a separate mashie course, Randpark is one of the golf clubs in Johannesburg that has three courses. The two 18-hole manicured courses, Bushwillow and Firethorn, as well as the third 9-hole mashie course, Creek 9, offer golfers world-class playability. It is for this reason that the club has some 1 000 full-time members on its books, and 3 000 overall. 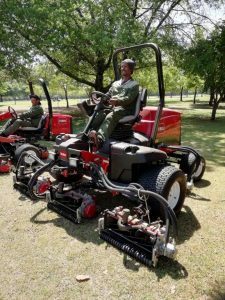 To keep the standards high, management recently invested in three new Toro machines to replace three old ones. However, it is the Workman HDX with Pro Pass Top Dresser that has made a massive difference. “We have deployed the new HDX for top dressing of the greens. It has since made such a massive difference at the club,” explains Rodger Innes, Head Green Keeper at Randpark. 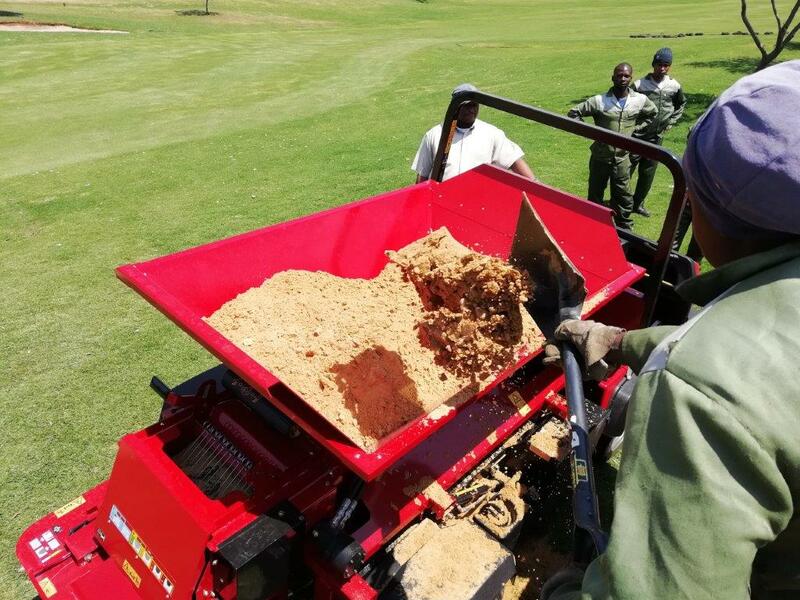 Topdressing entails spreading a thin even layer of fine sand over the playing surface. “Topdressing is one of the single most important procedures we can do to improve playing conditions, but also improve long-term turf grass health,” explains Innes. 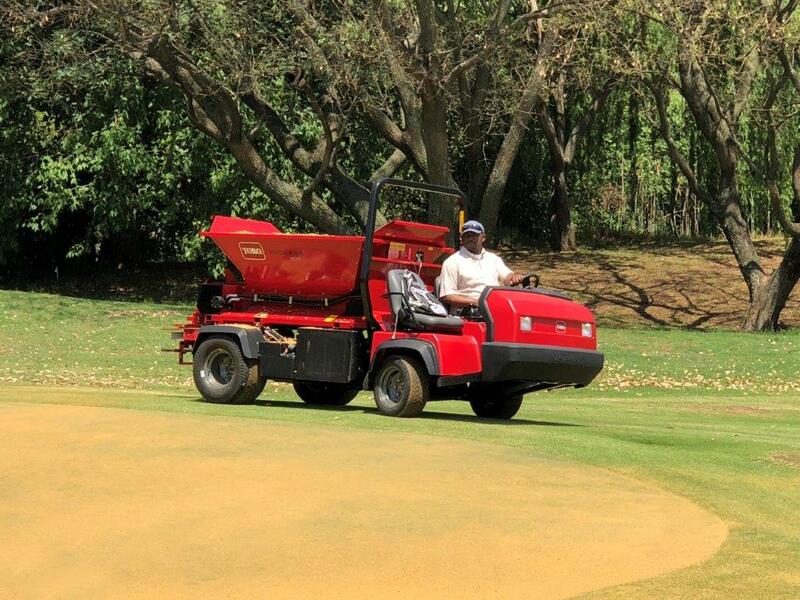 “Topdressing of greens is one of the most important procedures that every good golf course should do. 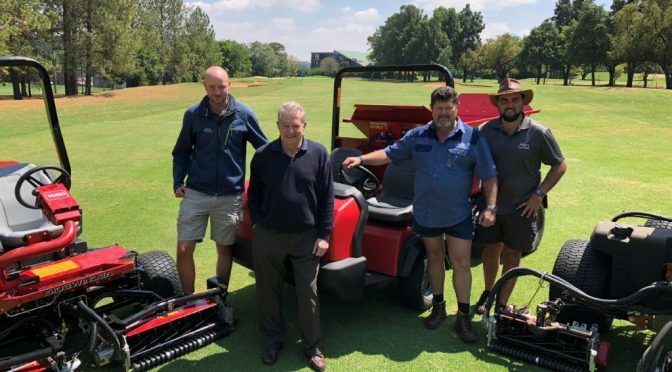 For us, it offers several benefits, including smoothing the putting surface, reducing/diluting thatch buildup, firming up the surface and offering overall improved grass health,” adds Innes. The Workman HDX with a Pro Pass Top Dresser, which has replaced an older version of the same machine (spec for spec) is offering new capabilities in that regard. It can topdress all the greens in just two hours, compared to double the time achieved by the older machine. “The machine is usually deployed once a week. However, with a tournament coming soon, we are using it twice a week. Its precision does make life easier compared with what we used to have,” explains Innes. 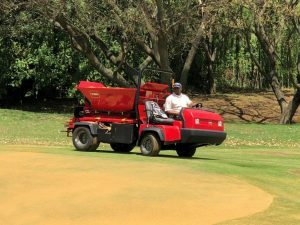 Conventionally, topdressing of greens at golf courses involves spreading a thin even layer of fine sand over the playing surface and then either dragging it in with a brush or watering it in with overhead irrigation sprinklers. 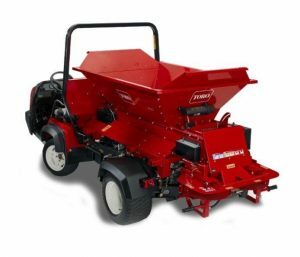 “The Workman HDX is a utility vehicle that undertakes three main tasks; Top dressing, spraying and fertilizing spreading.” explains Stephen Mangold, Toro National Sales Manager at Smith Power Equipment. “It’s a versatile utility vehicle that allows you to swap the implements around depending on the task you want to undertake. It’s also easy to swap the three implements around; it takes about 15 minutes,” says Mangold. However, Randpark has purchased the Workman HDX with a Pro Pass Top Dresser only. “In future we aim to get the spray as well to experience the full benefits of this masterclass of a machine,” says Innes. Powered by an 18,5 kW (24,8 hp) Kubota diesel engine, the Workman HDX is a 2-wheel drive machine with total payload capacity of 1 315 kg and towing capacity of 1 587 kg, making it compact enough to travel over the sensitive greens. 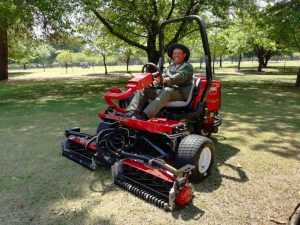 Joining the Workman HDX on Randpark’s new arrivals lounge is the Reelmaster 5510-D fairways mower. The 35,5 hp (26,5 kw) unit comes standard with the larger 17,8 cm diameter cutting units for heavy mowing conditions where extra capacity is needed. The light weight design of the 5510-D allows for reduction of weight without giving up performance and durability. 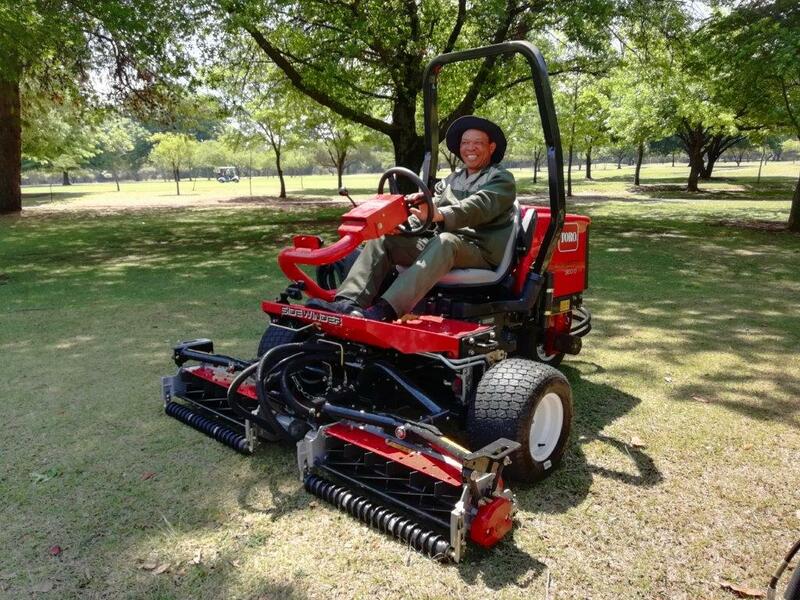 “They have taken delivery of a Reelmaster 5510-D fairway mower to replace the existing unit. The new one is exactly the same model, spec for spec,” says Mangold. The Realmaster 5510-D’s precision machined cutting units maintains a superior after cut and holds adjustments extremely well. Dual Precision Adjustment (DPA) allows quick bedknife to reel adjustment. 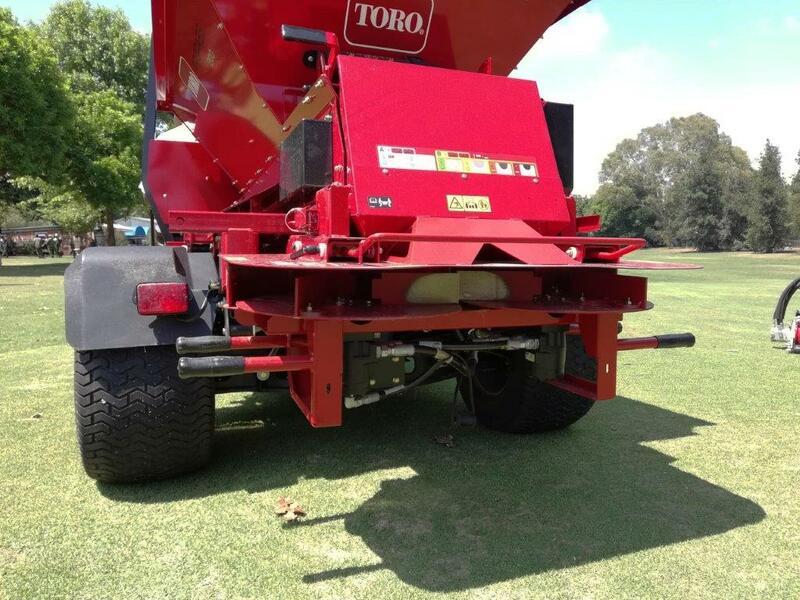 Harder reel and bedknife steel retain a sharp edge up to three times longer to minimise the need and frequency of adjustments, backlapping and grinding leading to healthier turf that stays green. Meanwhile, the new Reelmaster 3100-D is being deployed for semi-rough mowing. With a 21,5 hp (16 kw) Kubota diesel engine, the Reelmaster 3100-D has the power to climb and cut through difficult mowing conditions. The innovative Series/Parallel 3-wheel drive system provides power to at least two wheels at all times. The result is impressive traction in hilly and wet conditions, and minimal wheel slip so it’s gentle on the turf. Randpark has had a very long relationship with Smith Power Equipment. “We have been dealing with Randpark for the past 25 years. Part of the reason for the long relationship is that the Toro brand is the world leader in turf maintenance, but most importantly, it is the more than customer-supplier relationship we have established over the years,” explains Mangold. Randpark’s fleet is almost 100% Toro. 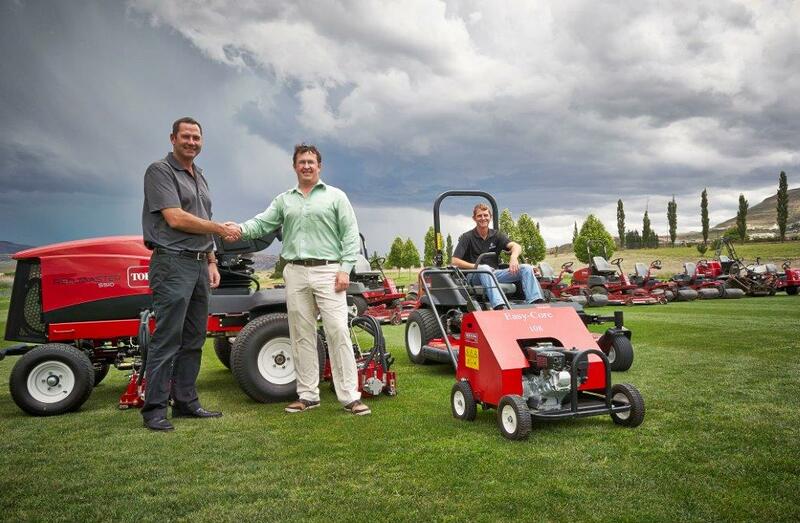 “I have been here for 16 years and we have always used Toro since I have been here,” says Innes. “We have a long relationship with Toro and Smith Power and even our people are used to these machines. The Smith Power team also goes the extra mile for us. For example, they have previously lent us spare machines when we are in need. So, buying decisions for us are automatic; we always go the Toro route,” concludes Innes. Contact Stephan Mangold on email: stephen@smithpower.co.za or 082 882 6935 or 011 284 2000.